>> How to Drill Holes in a Large River Rock with the Right Drill Bits? River rocks tend to have a smooth surface and are tumbled due to the time spent going downstream from mountains. They can form from different types of rocks, where some have a harder texture than others. 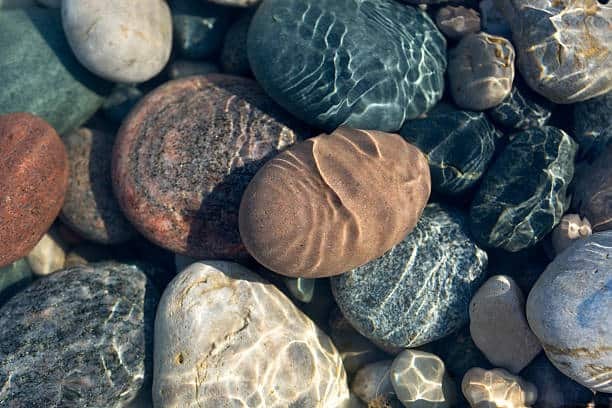 Some river stones possess a brittle shell that makes it difficult to drill them, while others are softer and it's possible to drill them using the right drill bits. In this blog, we take a look at how to drill holes in a large river rock. Start by choosing the large river rock you wish to drill, it should be a soft one to make the process easier. Place the stone in-between the leather in a vise. Tightening the vise will help keep the rock in place during drilling. Do not tighten it too much so that you don't chip the rock. Neatly draw the hole's size in the place you wish to drill on the stone's face. 4. Roll the putty to form a long rope and mold it into a circle. This should be able to fit fully around the circle you drew on the stone. Press this circle made of putty on the stone's face till it has adhered properly. Thereafter add some water inside this circle. The purpose of the water is to cool the diamond drill bit during drilling. Put on protective eye wear, an air mask and gloves. Use the heavy duty drill with a diamond drill bit and start to drill. Operate the drill at reduced speeds for great results. Very high speeds might burn out the drill bit. Continue to drill the large rock while keeping the circle made of putty filled with water. As you drill holes into stones, remember to be very careful and cautious to avoid accidents. What Kind of Drill Bit for Rock? The materials used to make drill bits and the finishes put on them, play a huge part in determining how long they will last and how they will work. There are different types of bits to use depending on the texture and size of rocks being drilled. To drill rocks you can use a well-made masonry bit together with a rotary hammer drill. Quality is very crucial and tools should be chosen wisely. You can also use a masonry bit made out of carbide, as it is more durable than the ordinary masonry bit. If you're using a hammer drill, ensure that the bit is compatible with the drill. This is because a standard bit may be damaged easily by the movement of the hammer leading to severe consequences. Masonry drill bits are usually used with a hammer drill. This drill operates by hammering the bit into the rock while it rotates. The hammering action fragments the rock at the bit tip, and then the rotating flutes dust off the dirt. The rotation of the drill bit moves the cutting edges towards a new part of the bottom of the hole, with each hammering action. Drill bits for hammers usually utilize unique shank shapes, which make it possible for the bit to move freely inside the chuck while hammering. Core bits are also rock drill bits that can be used to drill wide holes in rocks. Masonry bits that are up to 39 inches long can work together with hand-portable power equipment to drill very large rocks. Star drill bits, which resemble chisels or hole punches, are used as hand-powered drills together with hammers to drill holes into stones. The cutting edge of a star drill bit is made up of a number of blades joined at the middle to create a star shape. Diamond drill bits are typically used when drilling granite, limestone, marble and any other types of hard rocks. Carbide coated bits together with spear point drills are used on softer rocks like sandstones and marble. Carbide drill bits tend to wear out very fast and get chipped at the surface severely. This creates rough holes and usually leads to breakage because of fractures formed by the heat and the chipping. Diamond drill bits are better since they have tips made out of diamond that grind well into very hard rocks. While using diamond drill bits, it is important to drill at lower speeds and use a lot of water as lubrication. Variable speed drills are the most suitable because they allow you to properly choose the speed while drilling. Quite a number of fixed speed drills operate at minimum speeds of 600-800 rpm, which can be too quick for diamond drill bits. Never use hammer drills together with diamond drill bits. Diamond drill bits are made in varying shapes and sizes, but are basically of 2 main tip forms: hollow core bits and solid tip drill bits. In terms of application, there are also 2 main types of diamond drill bits: bonded and sintered drill bits. Solid tip bits consist of diamonds on both the tip and around the sides of the tip. They grind a complete hole the same size as the tip during drilling. On the other hand, hollow core bits consist of diamonds along the edges of their tips and slightly on the sides of their hollow tips as well. They are usually termed as hole saws because they saw (grind) a circle to form a hole. They saw the circle using the edge of the bit tip instead of its total diameter. Hollow drill bits make holes that are the same size as the tip and also a smaller-sized core that rises from the center of the hole. Solid drill bits are used for making smaller holes in rocks because they drill out the full hole. They are mainly used on soft rocks. This type of diamond drill bits are not suitable for extremely hard rocks or for making large holes. Hollow core bits drill out only a part of the hole they make, therefore they drill much quicker than the solid bits. These drill bits are suitable for drilling large holes and can be used on limestone, granite, marble, and other rocks. Bonded drill bits consist of diamonds that are bonded to the bit tip's edges. This type of diamond drill bits are typically slow-speed drill bits and are usually cheap in terms of cost. During drilling, the diamonds get worn off because of the hard and abrasive nature of the rock material being drilled. They need enough speed and plenty of water for lubrication during drilling. Sintered drill bits consist of diamonds embedded into the bit's metal tip, such that as the tip wears off, fresh diamonds are revealed on the surface. Sintered diamond drill bits are typically made for drilling deep into rocks, but it's good to get information from the manufacturer before using the drill bit. They are more costly than the bonded bits and drill at a slower pace as well since they're heavy duty. These sintered bits however, are more durable than the bonded bits.Basing on the texture of the rock being drilled and the drilling method, they may last at least 30 times longer. The durability of any kind of diamond drill bit is dependent on the abrasiveness, hardness, and thickness of the rock being drilled. It also depends on the particular drilling methods applied (the speed of the drill, the pressure and the lubrication). Diamonds do not get worn out as much as they get worn off because of the heat and friction created by the hardness and abrasiveness of the rock being drilled. Using diamond bits to drill rocks is not that hard but it takes patience. What would be the best method to drill through bedded river gravel to bedrock…..can water be used to bind gravel together and drill, what about stabilising the sidewall..